Whether it is due to an auto, motorcycle, truck or pedestrian accident, a slip and fall, a divorce, or child custody dispute, or a dispute with an insurance company, most people will require the assistance of an attorney at some point in their lives. When that time comes, it is important that you seek out a lawyer you can trust. Personal injury lawyer Bonnie A. Berns, P.A., is an experienced general practice attorney based in the Ormond Beach area. 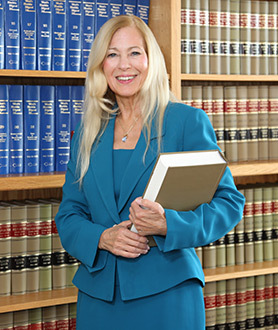 With more than 30 years of experience in a variety of legal practice areas, attorney Bonnie Berns is ready to handle many of the important legal issues that you may encounter throughout your life. Bonnie A. Berns, P.A., serves Ormond Beach, Palm Coast, Flagler Beach, Port Orange, Deltona, Daytona Beach, DeBary, DeLand and New Smyrna Beach; Volusia, Flagler, Hillsborough, Duval and Seminole counties; and many other locations in Florida. At our law firm, we get to know our clients on a personal level. When you schedule a free consultation with Bonnie Berns, she will meet with you one on one to learn more about your legal situation and the unique circumstances surrounding it. Once we understand what you need, our law firm can offer legal solutions that can help you reach your goals. Our experience across a variety of practice areas allows us to offer well-rounded legal assistance. If your concern involves issues from multiple practice areas, attorney Bonnie A. Berns can provide insightful guidance in seeking out the best possible resolution for your case. When you work with our law firm, professional legal assistance will always be close at hand. Our office operates with a 24-hour answering service, helping you connect with us in an emergency. You will also be free to contact attorney Bonnie Berns directly, even after hours. In all cases, our firm will quickly get back to you, providing answers to even the toughest legal questions. To schedule a free consultation with our law firm, please call 386-672-4040 or contact us online. We offer home and hospital visits whenever necessary, as well as Spanish interpretation services.